The Grand Concourse in the Bronx turns 100 this year. And to celebrate this momentous occasion, the Bronx Museum of the Arts and the Design Trust for Public Space held a competition on the re-imagination of this place for its next 100 + years. The winning submission in the “ideas competition,” is called pUMp — Purifying Urban Modular Parasite. The design concept includes an air filtration device that would be affixed to the Major Deegan Expressway, as this road in close proximity has been associated with the high levels of childhood asthma in the neighborhood. These pumps–made in the neighborhood by local residents–would hang over the road into about one lane of traffic in different locations. They would also be made for export from docks on the Harlem River, which is the economic development component of the concept. Other highlights of this plan include a tree farm which would train and employ local arborists to grow trees for regional use and exportation. While the ideas competition is just that…ideas, these submissions are a sign of the times. 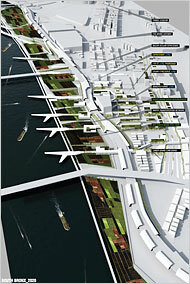 It seems that most of them do incorporate some aspect of sustainability or environmental urban planning. People who are imagining how cities can be better for people, by ecological design. But as the bottom of the Times write up on this illustrates, there are people who have concerns about whether or not the ideas fit the place. Largely working class new Americans, this neighborhood has come a long way since its days of urban blight. But people (these are all readers’ comments, not experts, but I think there is validity) seem concerned that basic needs (supermarkets over bodegas) should be thought about and then tree farms and carbon pumps. It is an example of the standard “Who is environmentalism for?” question. And perhaps there was a bit of flexibility in this competition because it was the ideas competition and not an implementation competition. But I think its great. If the green economy can be dreamed of and driven home through urban revitalization in places that need it most, this is amazing. Now we just need a merging of the vision and application. Environmentalism is for all. Humans and not, folks alive now, and folks who have yet to live.